Data is everywhere. Used for a variety of purposes, data helps individuals make more informed decisions. This need to arrive at more educated conclusions is driving many companies to increasingly rely on data in the hiring process. Measures such as personality tests, gamification, artificial intelligence, team interviews and mobile technologies are helping businesses find the right people to fill key positions. To gain some perspective on how much businesses are turning to analytics, 55 percent of respondents in a CareerBuilder survey said artificial intelligence would be a regular component of hiring and human resources within five years. Specifically, 39 percent indicated background checks would be fully automated, 38 percent said the same for applicant tracking and another 38 percent said performance management would be partially automated. Despite the ability of analytics to help businesses reach more informed decisions, there’s often a tendency to place too much emphasis on them, using them to make decisions rather than serving as a guide. As a result, it’s important that employers remember to use data as a supplement, not as a replacement to the more traditional processes of recruitment. Ask any coach, teacher or manager, there are certain assets that team members bring that can’t be fully quantified or qualified. These include a genuine willingness to help their co-workers, an upbeat attitude or exuding positivity. These often can’t be fully accounted for in personality tests. Thus, the traditional method of Interviewing – meeting candidates in one-on-one settings – is irreplaceable. 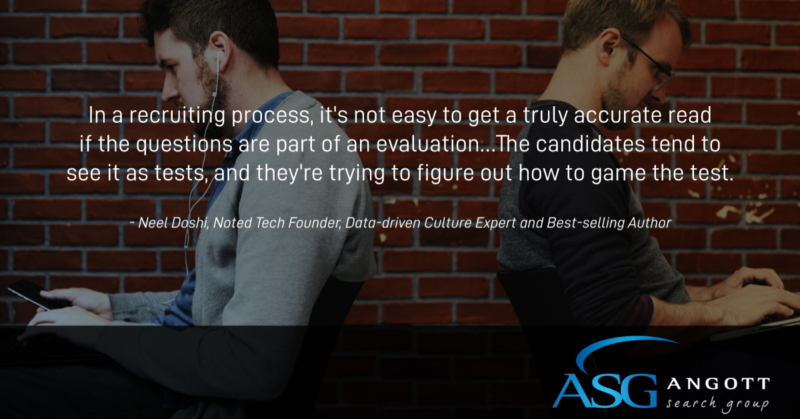 Because more businesses are utilizing tests in hiring, job seekers have adapted, providing answers that they may not genuinely believe, but sound good or score well, warned Neel Doshi, a noted tech founder, data-driven culture expert and best-selling author. In other words, assessments can be easily identifiable and candidates may alter their answers because they know they’re being evaluated. Information can be so all-encompassing, it can make the hiring process extremely nerve-wracking, filled with “What if?” questions that can leave you second guessing. Data is great to have, but too much of it can take the human aspect out of hiring, as there’s something to be said for relying on your best judgment and professional experience. Additionally, testing and then processing of the results adds more steps to the recruitment process. And the longer it takes to move through the hiring process, the greater the possibility of a candidate landing a position elsewhere. Sir Arthur Conan Doyle said it best: “It is a capital mistake to theorize before one has data.” But data should not be the “be all, end all” of personnel decisions. Working with a recruiter helps businesses better analyze information, so they can put it all in perspective and improve the caliber of talent that is coming into the organization.